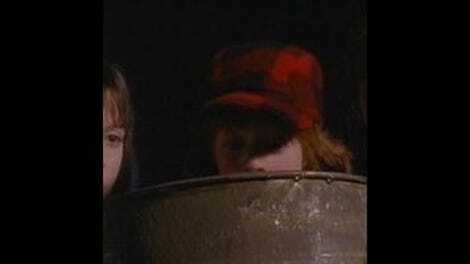 The Adventures Of Pete And Pete: "Tool And Die"
Tool And Die is, in my opinion, the best episode in season one of The Adventures Of Pete And Pete. It’s mysterious, gritty, and more than a little grim. It deals with tools — real spinning saws and Imprag rotary lathes that can tear off fingers and entire scalps. While the brunt of the episode isn’t about someone losing a finger or even losing a friend, the threat’s always there, setting a tone that kind of lurks over the whole episode, grey and smelling like sawdust. All of this is, of course, set off by the stellar acting of two ancillary characters: Rick Gomez’s “Endless” Mike Hellstrom and Jude Ciccolella’s Mr. Slurm. 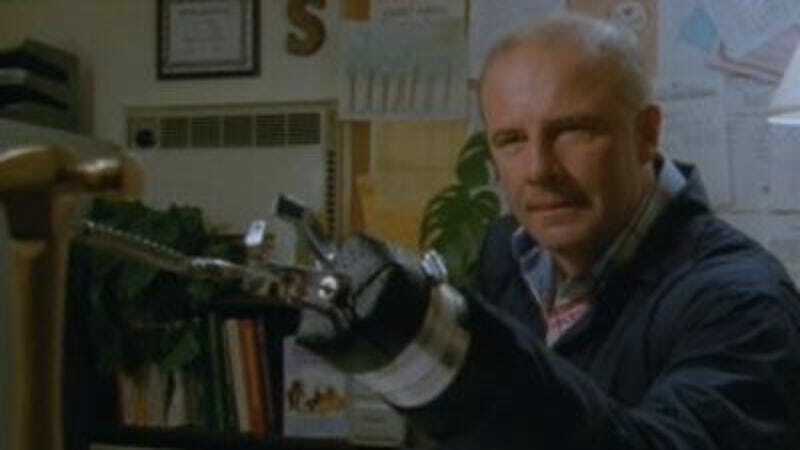 While we saw “Endless” Mike in last week’s episode, this week he really gets a chance to start shining, particularly when he gets to command shop class as a master sockethead, teacher’s pet, and school bully. “You need a tool,” he says, “you come to me. You need a nut, nail, screw, bolt, nut… you come to me.” It’s a simple, stupid speech, but honestly it’s so well delivered. It’s passionate and a little terrifying, and that’s the essence of “Endless” Mike in two words. Ciccolella’s a pretty well known actor these days, having appeared in 24, NCIS, Sin City, three separate episodes of the original Law And Order, and — this is my favorite — as Drew Barrymore’s dad in 1995’s Mad Love. With his buzz cut and growling demeanor, he’s a perfect shop teacher. He has an implicit backstory without ever divulging information — how did he lose that hand? Is that why he’s “stuck” teaching shop or does he actually like it?” — and can say the simplest sentences — in this case, about his secret project air conditioner’s three different settings — with this genuine sense of creepiness and warning that just imbues them with meaning whereas there really might not be any in the words on the script’s page. Ultimately, you could say this is an episode about learning to do things that scare you, about risk versus reward, but that might be simplifying things a little, or underselling the episode. When a 10 year old is selling limb-loss insurance in a business suit (A loss of three fingers earns the policy holder a dirtbike) and Ellen, a teenage girl, has become obsessed with metal and seeing the soul of a flame by staring into it, you’re kind of on a whole other level. People rave and rave about shows like Community that take on these grand themes and push their time slot in new and daring directions, but to me, this episode makes a case for Pete And Pete doing that almost 20 years ago. It’s not just that it’s a kids show that was dark and a little scary, because Nick had Are You Afraid Of The Dark for that. It’s more about the fact that it pushed boundaries of understandable dialog, of a sense of danger, and of what kids could really handle. They were, as the show in general and as this episode in particular shows, smarter than advertisers and networks gave them credit for, and if it took an episode about a sadistic shop teacher and a bunch of working class socketheads to prove that, then so be it. • When you watch this show for a semi-living, you begin to start noticing really weird things, like how Mark Mulcahy’s guitar strumming doesn’t match up with the audio during his solo in the opening, or how there were two jars of chives on the spice rack Big Pete ultimately makes. Lord help me. • It’s absolutely perfect that one time, when they show Mike, he’s carving a detailed fist out of wood. It makes total sense. • Slurm’s claw attachments include a flyswatter, pencil sharpener, and retractable pointer.